Fedora has been around since 2003 and has been a very popular Linux operating system. Fedora is owned and sponsored by Red Hat. The purpose of Fedora is to always have the latest and greatest technologies integrated into the operating system. Because of this Fedora is not well known for being the most stable operating system but none the less a great operating system. 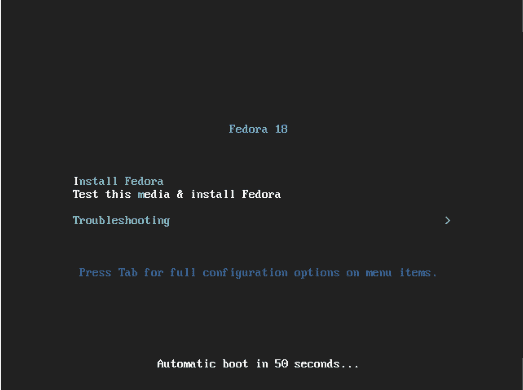 This guide will show you how to install Fedora 18 with the GNOME desktop environment as a dual-boot with Windows. Once you boot off of the Fedora 18 disk then your screen should look like the image below. From the Fedora 18 installation DVD boot loader select “Install Fedora”. Once you select install Fedora you be taken to the language selection screen. From this screen you will choose your language and click continue. On the next screen you will be taken to the installation summary. From here you will visit each one of these selections to make sure your settings are correct. The first selection is the date and time settings. Choose this option and then select your time zone. Once you have completed this click done. Next you will choose the software selection settings. 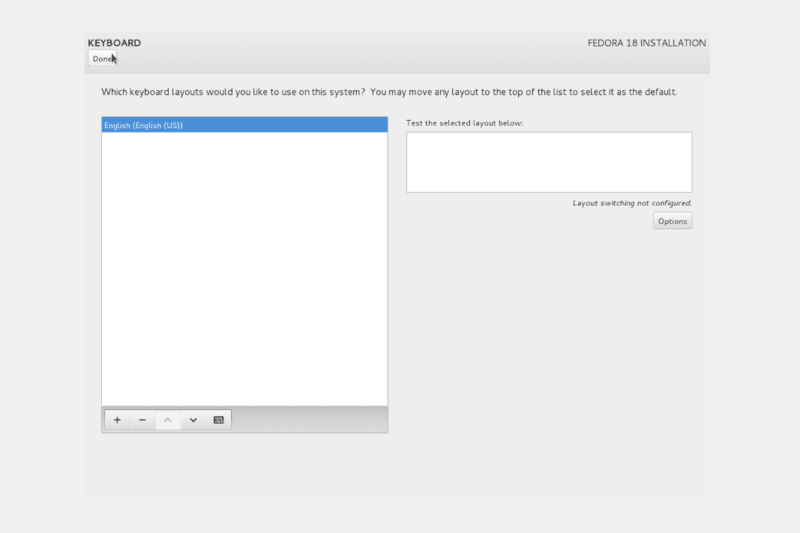 In the software selection options make sure that gnome desktop is selected and then click done. The next setting you will select is the installation destination. 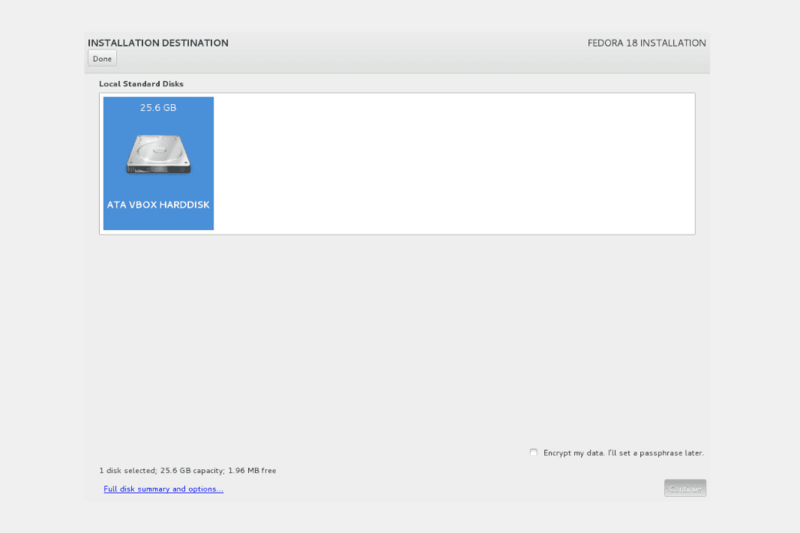 Once you have entered the installation destination settings you will select the hard drive you are installing to and then click continue. You will then get a pop up box in which you will select standard partition as the partition type and check “I don’t need help, let me customize disk partitioning.” Click “reclaim space”. Once you are at the manual partitioning screen you will select the NTFS partition with Windows on it and then modify the desired capacity to the amount of space you want Windows to have. Click apply changes. You will then click the plus sign in the bottom left corner to add a partition. When the pop-up window comes up, set the mount point to “/boot” and the desired capacity to “100” as shown in the screenshot below. Once you’re back to the installation summary screen click “Begin Installation”. Fedora 18 will then begin to install to your computer as a dual-boot with Windows. 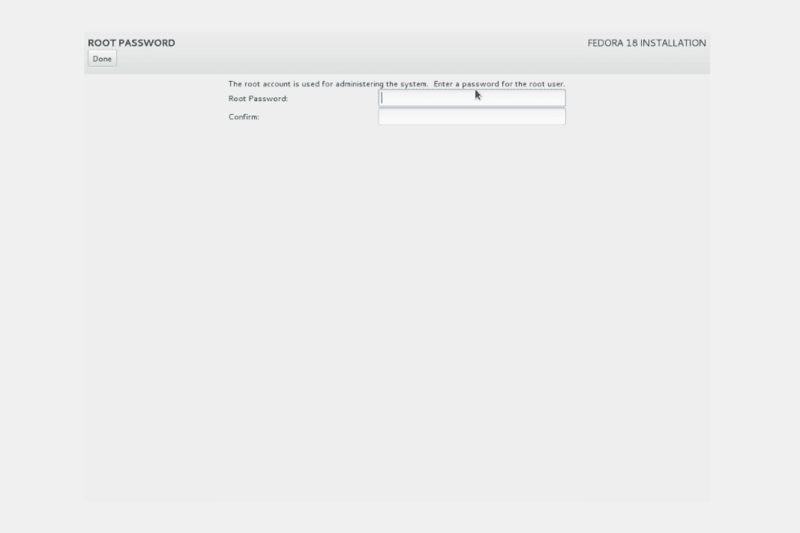 On the screen you must also set your root password. In order to do this click on the “Root Password” box. 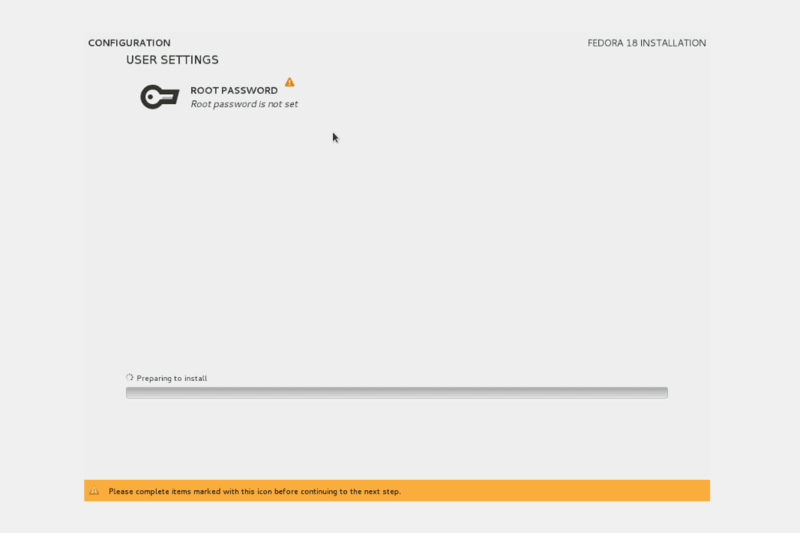 Enter the password you want root to have and then confirm it. Click done when finished. Now it is time to wait for the installation to complete. Be patient, this could take a while. Once the installation is complete, you will need to reboot your computer. Click reboot. Upon rebooting choose “Fedora” at the grub boot loader to boot into Fedora 18. It is now time to set some basic user settings for your new Fedora installation. Click forward to continue. On the screen you will need to agree to the license agreement. Click forward to continue. Now you need to enter your name, username, and password. Also check that “Add to Administrators group” is checked. Click Forward. 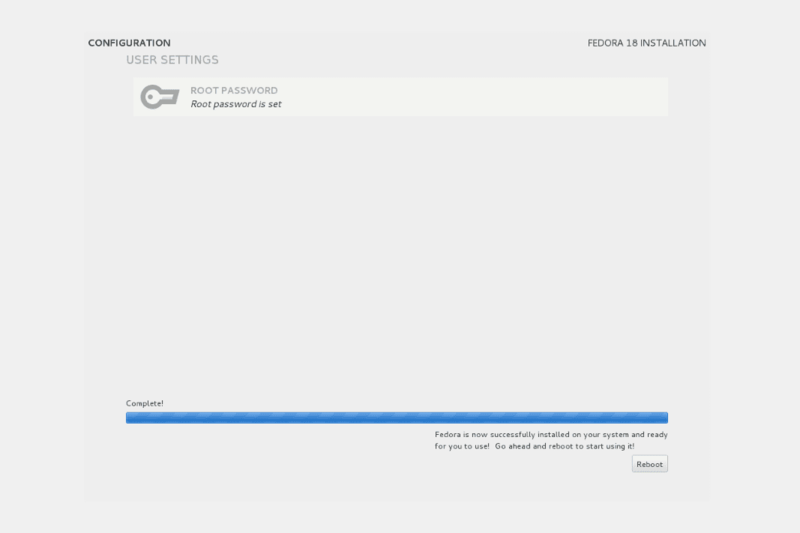 It is now time to login to your Fedora 18 installation using the username and password you provided on the previous step. Click your name and enter your password to log in. 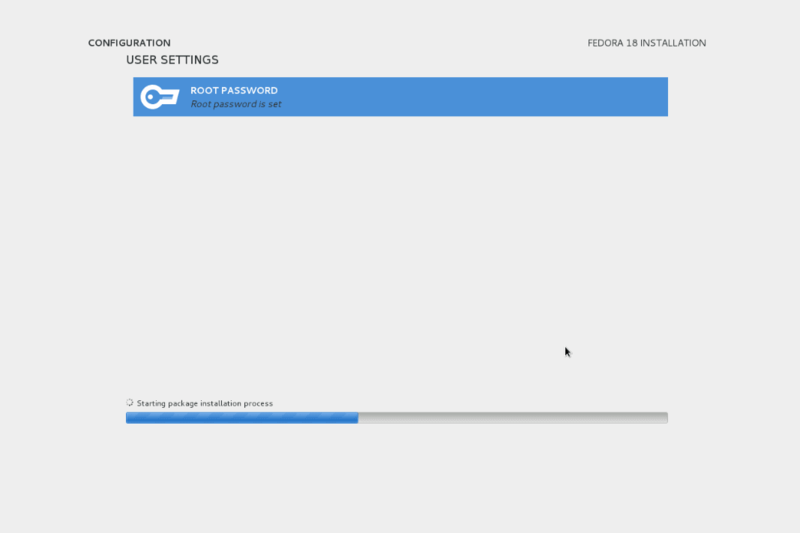 Once you have logged in, you will come to the Fedora 18 desktop. Your screen should look like the one below. Congratulations you have successfully installed Fedora 18 with the GNOME desktop onto your computer alongside Windows. If you like this guide, be sure to like and share on the toolbar to the left. Also be sure to leave a comment below and let me know if you have any questions. Enjoy.